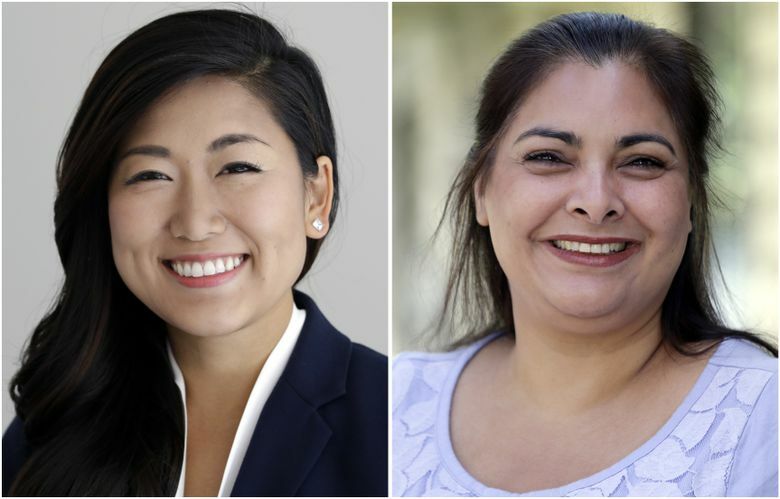 The battle between Democrat Manka Dhingra and Republican Jinyoung Lee Englund is by far the most expensive legislative race in Washington state history. Millions of dollars in campaign contributions have poured into the Eastside’s 45th District Senate race, turning the contest into a battlefield for powerful political interests. 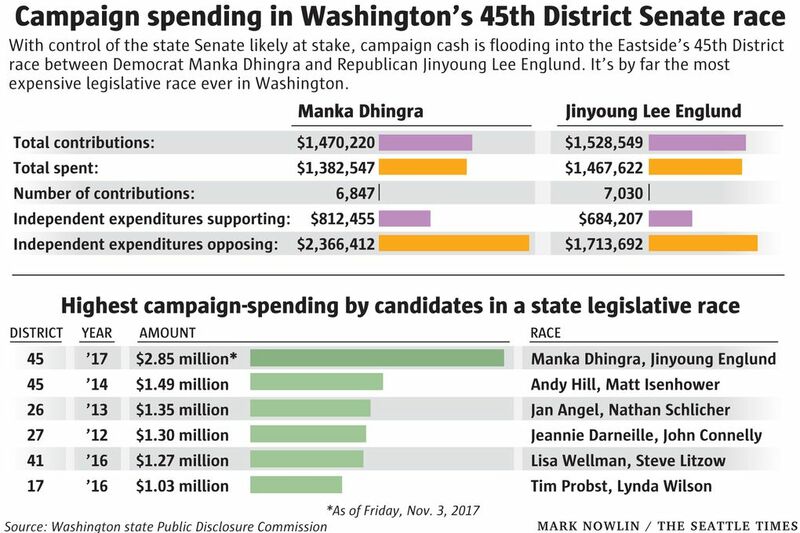 The contest between Democrat Manka Dhingra and Republican Jinyoung Lee Englund is by far the most expensive legislative race in Washington state history. More than $8.5 million total already has been raised by the two candidates or spent by independent political committees supporting or opposing their campaigns. The outcome of Tuesday’s vote is expected to determine which party controls the state Senate. A Republican-led coalition currently holds a one-vote majority in the Senate, while Democrats control the state House and the governor’s office. Combined, the Englund and Dhingra campaigns have spent nearly twice as much as the previous record-holder — the 2014 race for the same seat. That year, Sen. Andy Hill, R-Redmond, fended off a Democratic challenger. Hill died last fall, prompting Tuesday’s special election. As of Friday, the campaign of Dhingra, a senior deputy prosecutor for King County, had spent $1,382,547, according to state records. The campaign of Englund, who has worked in a variety of business, nonprofit and political roles, had spent $1,467,622. Outside political groups have spent even more to push their preferred candidate — or to savage the other side through negative ads. These groups have reported spending $5.4 million on election mailers, digital and TV advertisements, canvassing and other campaign efforts. Independent spending to support Englund has included six-figure donations from oil corporations like Tesoro (now known as Andeavor) and Phillips 66, BNSF Railway and the Building Industry Association of Washington (BIAW). Koch Industries, a company known for its conservative political advocacy, has kicked in $25,000. Gun-safety advocate and former New York Mayor Michael Bloomberg and climate activist and hedge-fund founder Tom Steyer have each contributed $250,000 to independent spending committees backing Dhingra. Washington Conservation Voters and the Washington Federation of State Employees — the largest state-worker union — have each made six-figure donations to independent groups supporting Dhingra. As in other recent races, contributions to independent campaigns in the 45th District race are often shuttled between multiple political action committees (PACs), a “nesting doll” tactic that can obscure the donors. “There is sort of a recognition that the creative energies of campaign money have found a handful of loopholes around transparency and genuine disclosure,” said Carlyle, who this year co-sponsored two bills to increase transparency in campaign spending. Sen. Mark Miloscia, R-Federal Way and co-sponsor of one of those proposals, SB 5108, said lawmakers must keep pushing for campaign-disclosure laws. For Englund’s backers, keeping the Senate under GOP control would provide a check against new taxes and regulations they say would be sought by Democratic lawmakers and Gov. Jay Inslee. That includes new taxes on carbon and capital gains, as well as restructuring the state home-sellers tax and the business-and-occupation tax, said Art Castle of the BIAW. The builders association has given $275,000 total this year to two outside groups — Enterprise Washington’s Jobs PAC and The Leadership Council — that have spent heavily to support Englund. Democrats could introduce “a lot of nonfriendly business legislation” if they held both the House and Senate, said Castle, a BIAW executive vice president. In recent years, the GOP-held Senate has made sure that such Inslee proposals as a carbon cap-and-trade scheme and low-carbon fuel standardswent nowhere. Inslee, meanwhile, has opposed a proposed Tesoro oil terminal in Vancouver, Washington. Phillips 66, which owns a refinery in Ferndale, Whatcom County, has given $250,000 to a spending group supporting Englund called Citizens For Progress Enterprise Washington. A handful of oil companies have also contributed to Enterprise Washington’s Jobs PAC. Andeavor, which owns the Tesoro refinery in Anacortes, has given $290,000, which was split between Enterprise Washington’s Jobs PAC and The Leadership Council. Democrats and Republicans in recent years have also fought over oil-train safety regulations, though they agreed on a compromise bill in 2015. A spokesman for BNSF, which has contributed $135,000, split this year between Enterprise Washington’s Jobs PAC and the Leadership Council, said several considerations go into its decisions. “For BNSF, it is vital to support candidates who understand the importance of trade to Washington state, support a pro-business climate as well as sound freight rail policies,” spokesman Gus Melonas said in a statement. Other donors to The Leadership Council include Altria (the parent company of Philip Morris) and RAI Services (parent company of R.J. Reynolds). For Dhingra’s backers, the Republican-held Senate has been a roadblock to advancing Democratic priorities such as environmental policies and gun-safety regulations. A Democratic-controlled Senate could support clean-energy legislation on a wide range of fronts, said Shannon Murphy, president of Washington Conservation Voters. The group this year donated $325,000 to New Direction PAC, which has been used to help elect Democratic candidates. That PAC has in turn funded Eastside Leadership Council, a spending group set up this election year to support Dhingra. A Dhingra victory could lead to more money for toxic cleanup, more oil transportation safety regulations, and more support for clean-energy policies and electric vehicles, Murphy said. Steyer, the wealthy environmentalist who also helped bankroll the 2014 Democratic campaign in the 45th District against Hill, has this year donated $125,000 to Washington Conservation Voters and $125,000 to New Direction PAC. Steyer could not be reached for comment. In recent years, the Washington Federation of State Employees has been frustrated with Senate Republicans, according to spokesman Tim Welch. This year’s initial state budget proposal by the GOP largely rejected the union contract raises negotiated through Inslee’s office. Sen. Dino Rossi — a Republican appointed to temporarily fill the 45th District Senate seat following Hill’s death — this year sponsored a bill to limit union contributions to the governor from unions that negotiate with the state. The federation, which has donated $225,000 this year to New Direction PAC, is also frustrated the Senate refused to vote on a new capital-construction budget, Welch said. “We believe that this current Senate majority is not friendly to working people,” said Welch. Former New York Mayor Bloomberg this fall gave $250,000 total to New Direction PAC, which has given more than $1 million this year to Eastside Leadership Council to support Dhingra. Bloomberg couldn’t be reached for comment.